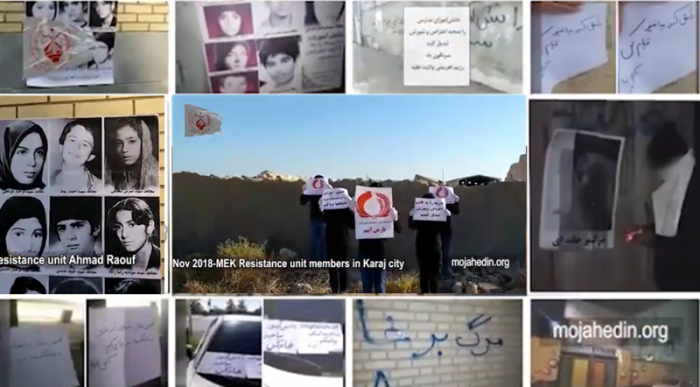 On Monday, members of the MEK’s Resistance Units took several actions against the Iranian regime in an escalation of the uprising currently taking place in Iran. MEK members set fire to the entrance of a Revolutionary Guards (IRGC) Basij base in Kermanshah in a dramatic show of rebellion against the repressive Iranian regime. The base is home to a number of the regime’s repressive Units. In Gachsaran, they put up graffiti saying, “Death to Khamenei” in public places. MEK members in Tehran and Shiraz publicly displayed posters of MEK members who were murdered by the Iranian regime. Resistance Units in Mashhad, Isfahan, and Amol put up graffiti and posters calling upon students to organize protests on their campuses. These acts of resistance take place against a backdrop of widespread anti-regime protests that have rapidly spread throughout the country. Economic unrest, along with dissatisfaction with the mullahs’ mismanagement and corruption, has caused Iranians from all walks of life to take to the streets to demand regime change. 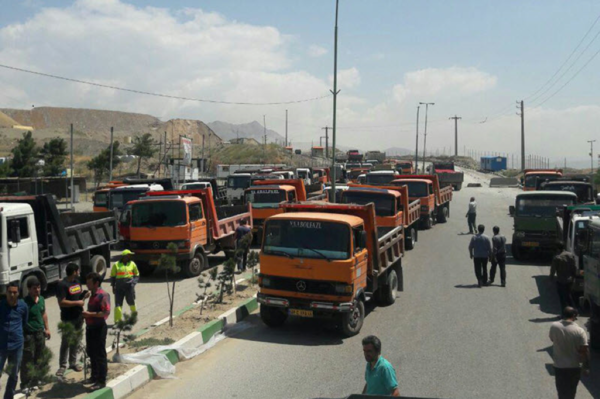 Iran’s truck drivers entered their seventh continuous day of strikes, despite threats from the regime. The strike has now spread to 35 cities in 18 provinces across Iran, including Isfahan, Najafabad, Sabzevar, Mashhad, Ardabil, Qazvin, Mobarakeh, Yazd, Zarrin Shahr, Rumeshgan, Kermanshah, Shahr-e Kord, Sirjan, and Sabzevar. The striking truckers are protesting low pay, the high price of spare parts and replacement tires, high fees, and poor working conditions. They are also demanding the release of their imprisoned colleagues who were arrested during the last round of strikes. During the last round of strikes, more than 200 truck drivers were arrested for participating in the strikes, and 17 of the arrested drivers were threatened with execution. In Chabahar, Naval University students gathered to protest school officials’ incompetence and their schools’ food services. In Tehran, Open University students from the Medical Sciences Department rallied outside of the main building of the campus and outside of Parliament over unfair conditions at the school. In Behbahan, young people held a protest at Friday prayers. The protesters were angry because they were not hired at the local refinery in favor of non-locals who would work for lower wages. the scarcity of water and lack of access to water resources. The regime has dried the Zayanderud River by diverting its water away from the Isfahan region to factories controlled by the Revolutionary Guards. The diversion of water, along with record droughts, has destroyed the farms of once-prosperous Isfahan farmers and caused water shortages throughout the region. 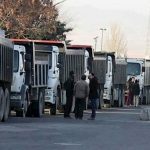 The Iranian truck drivers have entered their 5th day of the strike for the fourth time this year. Monday marked the fifth consecutive day of strikes by Iran’s truck drivers. The MEK network inside Iran reported that the latest round of strikes has spread to 44 cities in 23 provinces across the country. The strikes have garnered widespread support from Iranians from all sectors of society. Truck drivers across Iran are parking their trucks and refusing to carry loads. 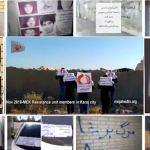 Videos shared on social media by the Iranian Resistance show evidence of the strike taking place across Iran. 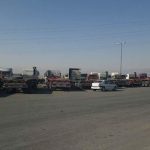 In Dezful and Mashhad, the loading stations were filled with parked trucks. In Marand, East Azerbaijan Province, the roads were empty of heavy trucks. This is the fourth strike this year for Iran’s struggling truck drivers. The drivers are protesting low wages, high prices for spare parts (particularly replacement tires), corruption, high fees, and safety issues. The drivers are also demanding the release of their colleagues who were arrested in the previous strikes. During the third round of strikes, the regime arrested over 200 striking drivers and threatened to execute 17 of the detained drivers. The strikes gained international attention from labor unions, including the Teamsters and the International Transport Workers’ Federation (ITF), who called the threat of executions a blatant violation of labor rights. The Iranian regime has ignored the pleas of its truck drivers even as its roads have emptied. It has ignored four strikes and international outcry at its acts of brutality. Truck drivers make up a crucial part of Iran’s infrastructure, and they cannot be silenced. The country cannot function without truckers, and truckers cannot function within the corrupt regime. Something has to change. Iran’s truckers have launched a new round of strikes in cities across the country. The latest round of strikes is the fourth to take place this year. The drivers hope to secure the release of colleagues who were arrested in previous strikes and to compel the regime to respond to their demands. 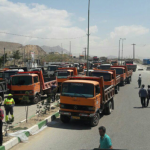 Truckers in cities across Iran are participating in the strikes. Reports from the MEK network indicate that strikes and rallies have taken place in Najaf Abad, Shahroud, Asaloyeh and Shadgan, among other cities. 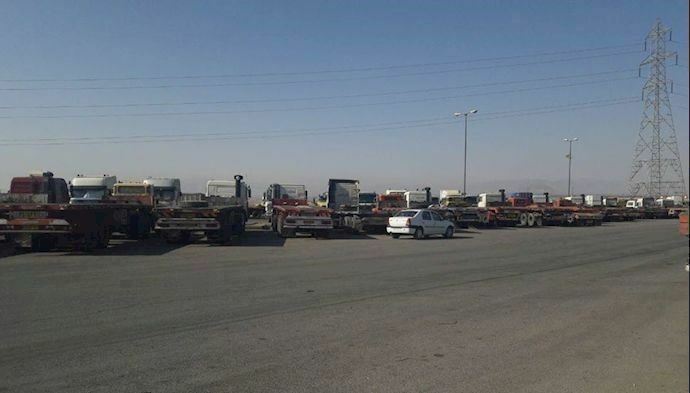 Truckers in Najaf Abad in central Iran parked their trucks and went on strike after receiving a call to launch a nationwide protest that was posted on social media. 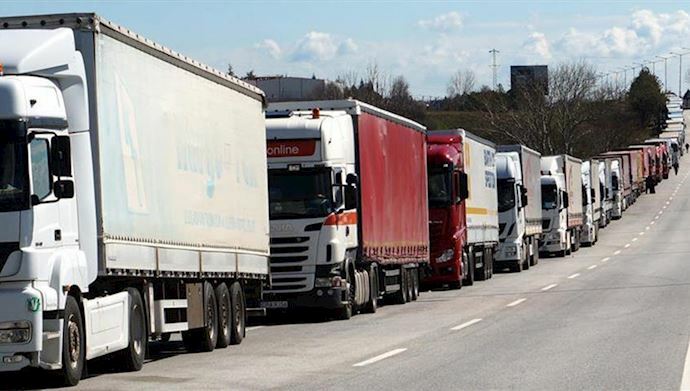 Drivers on the road to Isfahan report that the road is empty of heavy trucks, which means it is likely that truckers are heading the call to strike and joining the protest movement, a report from MEK network inside Iran indicates. The state-run ILNA news agency reported that Iran’s poultry farms have already been affected by the strike. Because truck drivers refuse to carry goods, the farms have no chicken feed. The Chairman of the Board of Directors of the Egg Laying Hens Union of Tehran said that the strike has led to severe shortages. “There are lots of goods in the ports but not enough trucks to transfer them to factories,” he said. The last round of truck drivers’ strikes went on for 21 consecutive days and ended just last month. Security forces arrested more than 200 truck drivers for participating in the strikes and threatened to execute 17 of the arrested drivers. The drivers garnered worldwide support from labor unions, including the International Transport Workers Federation (ITF) and the Teamsters, including others, who condemned the regime’s treatment of the drivers and their threats of execution. Ministry of Road & Construction eventually agreed to concede to one of the truckers’ demands. The regime promised that transfer fees on loads within Iran will now be based on the ton/kilometers standard. It remains to be seen whether or not this promise will be honored. The regime has made concessions after previous strikes that have gone unfulfilled or partially fulfilled. Iran’s truck drivers have lost weeks of pay due to the strikes. The truckers have been intimidated by the regime, arrested, and threatened with execution. Truck drivers make up an integral part of Iran’s infrastructure, but they struggle to pay their bills and to do their jobs safely. When they park their trucks, they do so because they have no other choice. The MEK supports the striking drivers in fighting for a fair labor system and a democratic country in which no worker must work in unfair conditions for poverty-level wages. 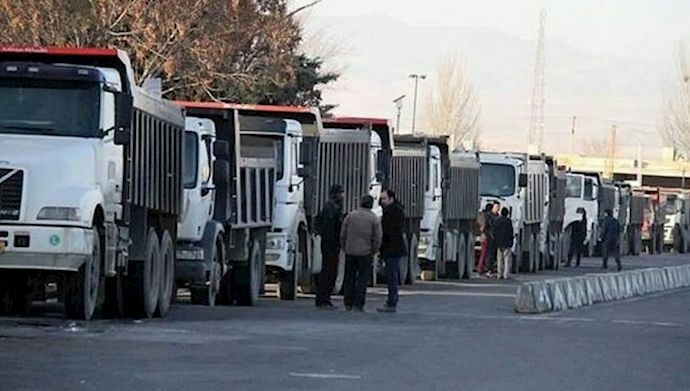 In a letter or condemnation, five international trade unions expressed “deep shock” over the recent demand by Qazvin Province’s prosecutor general to execute seventeen truck drivers for their part in the nationwide truckers’ strikes that began in late September. The International Trade Union Confederation (ITUC), the International Transport Workers’ Federation (ITF), Education International, the Industrial Global Union and the International Union of Food, Agricultural, Hotel, Restaurant, Catering, Tobacco and Allied Workers’ Associations (IUF) called the possible executions a blatant violation of labor rights and said that it was unacceptable to execute workers for asking for economic rights. The trade unions’ letter asked regime Supreme Leader Ali Khamenei to reverse his accusations against the arrested drivers and to guarantee their safety. They also asked that the Committee on Freedom of associations and the Committee of Experts on the Application of Conventions and Recommendations (ILO) to inform the regime of its responsibilities to its workers and to reaffirm their fundamental rights. 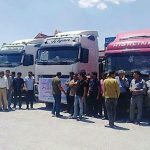 The most recent truck drivers’ strike started on September 23rd, 2018 and went on for three weeks, spreading to 310 cities in every province in Iran. This was the third strike by Iran’s beleaguered truck drivers this year. The truck drivers face unsafe conditions, subpar pay, corruption by officials, and exorbitant prices for replacement parts, particularly tires. Truck drivers cite a 600% increase in the price of spare parts. 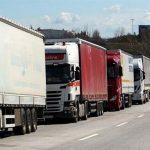 Striking truck drivers were arrested for “disturbing the transportation and provoking the drivers to strike” in a number of provinces, including Tehran, Fars, Isfahan, Khorasan Razavi, Kurdistan, Lorestan, Western Azerbaijan, Zanjan, Qazvin, Alborz, Hamedan, Charmahal Bakhtiari, Kermanshah, Kerman and Bushehr. The MEK has been active in its support of the striking drivers. The MEK’s Resistance Units continue to work with all of the workers of Iran to fight against the regime and it’s corrupt and inhumane policies that have left 75% of the Iranian people in poverty. The death penalty is a tool for terrorizing the society and a significant instrument for preserving the regime. Both factions benefit from such endless savagery to prolong the regime’s rule. During the strike, Mrs. Maryam Rajavi, President-elect of the National Council of Resistance of Iran (NCRI), called upon human rights organizations, labor rights defenders, unions and labor syndicates to support the striking drivers, urging that they take immediate action to call for the release of those drivers who had been detained. “When regime threatens strikers with death, it must be isolated by the international community,” she said. Wednesday marked the 18th day of the latest round of strikes by Iran’s truck drivers. The truckers are protesting the high price of replacement tires and spare parts, low pay, rising prices, corruption among officials, and increasing fees. 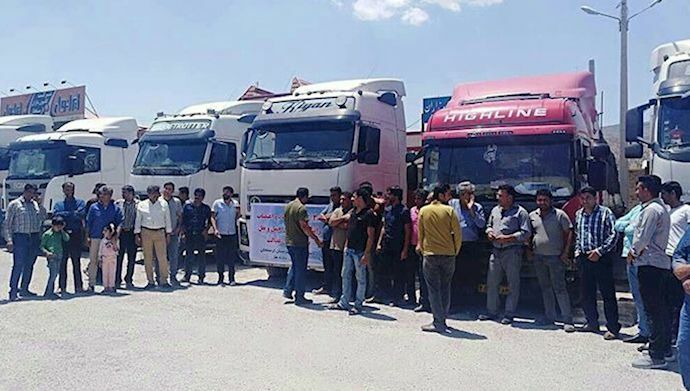 This is the third round of strikes since May by Iran’s hardworking truck drivers. Despite earlier promises by the regime, the truckers’ demands have gone unmet, forcing the drivers to park their trucks once again. Truck drivers play an essential role in Iran’s infrastructure, but they are not valued by the country’s corrupt regime, leaving half of Iran’s transportation workers living below the poverty line. A video shared on social media from Fars Province showed factories loading goods onto pickup trucks because there are no trucks to take the deliveries. The MEK’s resistance units are currently working with the striking truckers to help organize their protests. 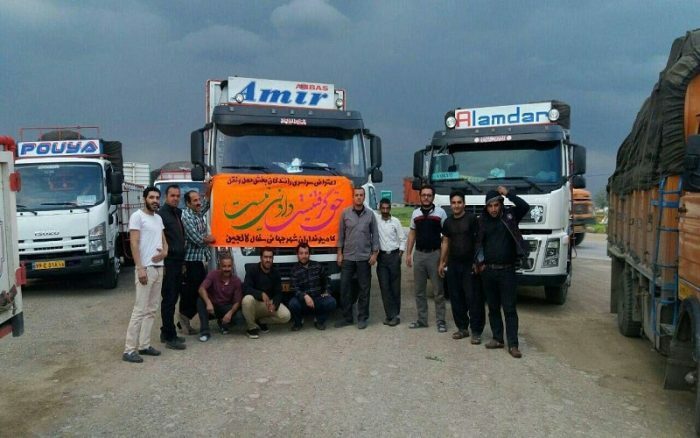 Mrs. Maryam Rajavi, President-elect of the Iranian Resistance, commended the truck drivers and encouraged Iran’s youth to support them in their strike. A video from Fars Province shows that factories are forced to load their goods into pickup trucks as a result of the ongoing strike. 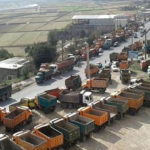 A video taken in Doroud, in Lorestan Province, shows parked trucks in loading terminals. Truckers continuing their nationwide strike, spreading to 320 cities across all of the country's 31 provinces. A court in Qazvin followed through on this threat, requesting the death penalty for 17 detained truck drivers. The truckers’ strike has deeply impacted the lives of the truckers and their families, who were already struggling to survive on their meager salaries. With each strike, the truck drivers go without income for weeks, making their already precarious financial situations even direr. The striking truckers now also face arrest and the possibility of execution by the brutal regime. Nevertheless, the strikes continue because the drivers see no other way to protest conditions that make their jobs unsustainable. Iran’s truck drivers strike enters its third week, despite regime’s repressive measures including the arrest of dozens of drivers. 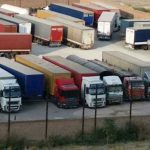 Despite threats to their liberty and lives, the truck drivers of Iran have continued their strike into its third week. The strike has spread rapidly across the country, now engulfing 310 towns and cities across the country, including Tehran, and towns in Fars province, Isfahan, Lorestan, West Azerbaijan, and Hamedan, amongst others, reports by MEK‘s network inside Iran. Significant numbers of striking drivers have been detained by regime officials. The Fars province Judiciary announced that 35 drivers had been arrested. In Isfahan, the figure was 13. At least a further 168 drivers have been arrested in other parts of the country, according to the National Council of Resistance of Iran (NCRI). The drivers are being charged with crimes such as “disrupting the flow of transportation” and “provoking drivers to strike”. The regime’s Chief Prosecutor, Montazeri, threatened the striking drivers with execution two weeks ago. Mullah Larijani echoed his comments, asserting that those involved would be severely punished. But still, in a remarkable display of courage, the striking drivers have turned out in force, with far-reaching results. Because around 90% of Iran’s goods are transported via the country’s elaborate network of roads, the truck drivers’ strike has been crippling for the Iranian economy. The state-run news agency has used the success of the strike to attack the strikers. Fars News Agency accused the drivers of “causing dissatisfaction in the population”, and of harming the country’s economy. But it is not the drivers harming the economy, it is the mullahs themselves. The strikers are protesting exorbitant insurance premiums and logistics costs, rampant corruption among regime officials, arbitrary tolls and taxes, and ever decreasing wages. If the mullahs took steps to end this rampant abuse of power, the striking truck drivers would return to work and the Iranian economy could continue to turn over. The price of spare parts for trucks has increased by more than 600% in recent times. Many truckers cannot afford to replace tires, putting them out of work. Even when they do earn, the plummeting value of the rial means few are able to earn a livable wage. When the truckers are working, road conditions have deteriorated to the point that many are unsafe and cause further damage to the trucks. Which means more expensive repairs, keeping truck drivers in a perpetual spiral of poverty. In an attempt to break the strike, the regime made false promises. In footage released from Bandar Abbas Terminal, plainclothes regime agents can be seen disseminating falsehoods in an attempt to get the striking drivers to return to work. The President-elect of the NCRI, Maryam Rajavi, pledged her support for the striking drivers. She urged the general public to stand with them in a gesture of solidarity. The leader of Iran’s main opposition also condemned the regime’s repressive and violent response to the strikes. She cited the arrests and violence as a sign of the regime’s vulnerability. Maryam Rajavi also reminded the public that the mullahs are to blame for Iran’s plunder and economic demise. Their thieving and mismanagement created this situation, not the brave Iranians taking to the streets in protest. Finally, she urged human rights organizations to pressure the regime to free those arrested. She also implored the international community to reject Hassan Rouhani and his violent and criminal regime from the international community. There should be no place for barbarians and human rights abusers among the international heads of state. 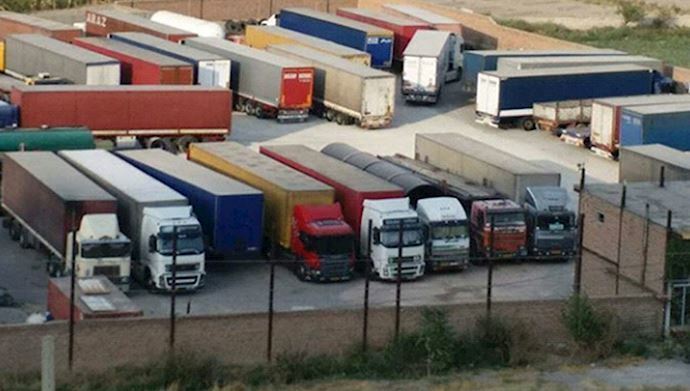 Truck Drivers continue on strike on their 10th day, due to high prices and Iranian regime’s extensive corruption. On Friday, October 5th, American Thinker published a piece by Hassan Mahmoudi entitled “Striking truck-drivers crippling Iranian regime”. In the piece, Mahmoudi examines the impact of the rapidly escalating truck driver’s strike in Iran and explores the regime’s responses. 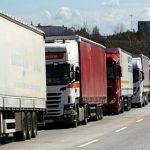 Truck drivers across Iran are parking their vehicles across busy streets in protest at the rising business costs associated with the logistics industry. Specifically, the protestors grievances lie in corrupt officials, rising fuel costs, high repair costs, low salaries, and poor road conditions. The national tax department has also imposed unjust taxes on truck drivers, forcing an already underpaid sector into dire financial circumstances. The drivers are demanding management change within the extensively corrupt Road Maintenance and Transportation Organization. Mahmoudi cites several reports indicating that the strike has had a profound impact on the national economy. Cargo terminals across the country are inactive or closed as protestors in 259 towns and cities have stopped working. In response to the escalating threat to the economy, Supreme Leader Khamenei’s Chief Prosecutor, General Montazeri, announced the arrest and execution of those involved. His statement read, “they [the protesting truck drivers] are subject to the rules and regulations of banditry and the punishment of the bandits according to the law is very severe, sometimes resulting in the death penalty”. The aggressive statement from Montazeri represents a U-turn for the Iranian regime. Just two days previously the regime was denying the existence of the strike. The transportation director-general of Fars province had referred to the strikes as nothing more than “rumours”. At this difficult and uncertain time for the truck drivers and their families, Maryam Rajavi, President-elect of the National Council of Resistance of Iran (NCRI), pledged her support. Maryam Rajavi denounced the threats of the regime as “vindictive” and saluted the truck drivers for their defiance. She urged the Iranian youth to stand with the striking drivers in their crusade to end corruption. She added that the real bandits in Iran were the mullahs, who use their repressive and violent regime to silence the demands of the Iranian people. Finally, Ms. Rajavi called on human rights groups to respond to the calls of the Iranian people. She urged them to intervene to secure the release of Iranian prisoners and pressure the international community to take action against the bloody and corrupt clerical regime. There should be no place at the table for a regime that threatens protestors with execution. 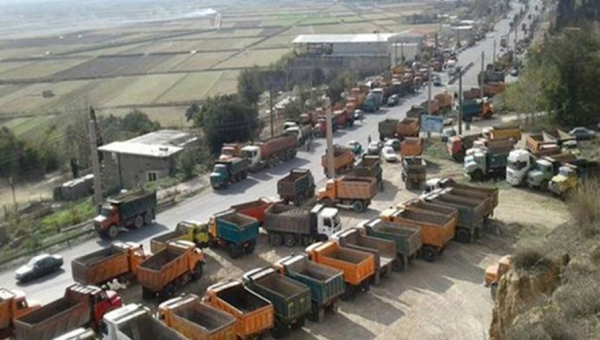 The Iranian regime threatens to execute truck drivers if they continue their strike over high prices and the lack of management to deal with their basic needs. The truck drivers’ strike in Iran has ploughed into its eighth day and shows no sign of letting up. Truck drivers in more than 220 towns and cities across the country have stopped working in protest of low salaries, the rising costs of spare truck parts, and a lack of response from the Iranian authorities. The regime’s response has been heavy-handed. Last week more than 15 drivers were arrested for their involvement in the protests, but with arrests doing little to deter the protestors, the government is threatening to take things a step further. The regime leadership sent Chief Prosecutor General Montazeri to threaten the strikers. The state-run news stations have also rushed to portray the strikers as a public menace. On State TV, the Chief Justice of Fars province, Ali al-Qasimehr, described how the strikers were causing “corruption on earth”. A Brigadier General of the Islamic Revolutionary Guard Corps (IRGC), General Mohammad Sharafi, also threatened the protestors with a strict response. However, the threats mark a significant change of message from the regime and its leadership. Just two days prior to the execution threats, the Director General of Fars Province Transportation had refused to acknowledge the existence of the strike. He suggested that news of truck drivers striking was nothing more than a rumor, telling the official IRGC news agency, “ rumors about [a] truck drivers’ strike have been circulating in the media and [on] cyberspace”. He blamed the regime’s opponents for the “rumors” and accused them of creating a crisis within Iran. 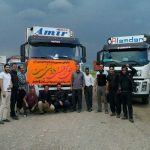 Although the regime has sought to silence and undermines the truck drivers’ message wherever it can, the striking drivers have drawn support from the Iranian public and the Iranian community living in exile around the world. President-elect of the National Council of Resistance of Iran (NCRI) and leader of the People’s Mujahedin Organisation of Iran (MEK), Maryam Rajavi, pledged her support to the striking truck drivers. She condemned the regime’s threats against the dignified and hardworking drivers, calling the regime the true bandits, not the drivers. The mullahs are unwilling or unable to respond to the truck drivers’ demands. Their violent response of carrying out arrests and threatening the protestors with execution is the only way they can hold onto power. It indicates the regime’s weakness and an uncertain future in power. Thousands of truck drivers in over 250 cities throughout all of the country's 31 provinces are continuing their strike. Maryam Rajavi and the MEK urged the international community to assist the striking drivers and reject the Iranian regime. She also called on human rights groups to denounce the arrest of protestors and highlight the regime’s abuse of power and silencing of the political opposition. There should be no place among the international community for a leader that has such blatant disregard for the rights of his population. Truck driver’s strike continues into sixth day to object the rising prices and the repressive measures imposed on the drivers. The strike covered 220 cities across Iran. Iran’s truck drivers continued their strike on Friday, despite the arrests of 15 striking drivers on Thursday. Friday marked the sixth day of the strike, which has now spread to more than 220 cities across the country. “Individuals who disrupt people’s lives by blocking truck commuting in our roads and damage people’s lives will be facing firm action,” he added. Arresting drivers is a departure from the regime’s usual method of dealing with truck drivers’ strikes. Iran’s truck drivers have gone on strike twice already this year, and the regime has responded by intimidating the drivers with threats, setting trucks on fire, trying to transport cargo with army trucks, attempting to lure drivers to terminals with replacement tires, claiming that the MEK was responsible for fomenting dissent, making minor concessions to the drivers, and making a series of promises to the drivers that went unfulfilled after the strikes ended. penalties for authorities who bribe drivers. The truck drivers have received an outpouring of support over the last year from international truck drivers unions and transportation labor groups. Each time the truckers go on strike, they lose wages for days and face intimidation from the regime. The drivers already struggle to maintain their vehicles and pay their bills. Iran’s truck drivers are on strike for the third time in one year because they have no other choice. It has become too expensive to do their jobs. On September 23rd, protests flared again across Iran as a new round of anti-regime protests spread across the country. The protests began with a yet another strike by Iran’s truck drivers. The strike began in 40 cities, but MEK sources inside Iran report that, as of Wednesday, the strike has spread to 190 cities. Truck drivers make up an essential part of the framework of Iranian society. Past strikes by the country’s truck drivers have caused massive disruptions throughout Iran, forcing the regime to acknowledge their importance and make a series of concessions to the drivers. Despite these token concessions, the majority of Iranians in the transportation industry live below the poverty line. Truck drivers find themselves struggling to pay for replacement tires for their vehicles because of the regime’s mismanagement and corruption. Without the support of their government in addressing this issue, they have no alternative but to strike. The truck drivers’ strike is expected to lead to additional protests by other workers. The merchants of Tehran are planning to strike next week. Tehran’s merchants sparked the August uprising over the devaluation of the rial, which brought protesters in cities across Iran into the streets to protest. The rial plunged again on Tuesday, selling at 18,000 rials to one U.S. dollar. It is worth noting that the last uprising occurred under almost identical circumstances, also in solidarity with a truck drivers’ strike. Rampant unemployment and factory closures are additional factors that are likely to drive people to the streets to protest. Factory workers in Zarandiyah and Saveh from more than 35 closed facilities have waited more than 10 months for their salaries. The impending U.S. oil sanctions add to the growing tension. The people of Iran are restless and dissatisfied. They see the regime for what it is, and they see an alternative. A new round of protests is here.